It is time for me to give my prediction for the December 3 election in Venezuela. It is actually tougher than what I thought it would be. 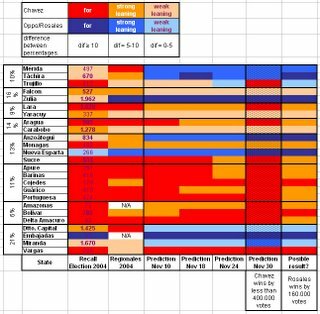 Contradictory polls played havoc with rationality, thus I had to stick to my trusted excel sheet which is reproduced below. First a reminder of how this one started. I took the CNE numbers of 2004, both Recall Election and Regional Elections later that year. I assumed that there was no cheating and that those were the true results (what I call the "Chavez advantage"). Then I factored in the local politics effect on the ability of Chavez to keep his voting strength. I do not know the local politics of all Venezuelan states, but I think I have a reasonable understanding of at least the 5 big ones and some of the smaller ones. 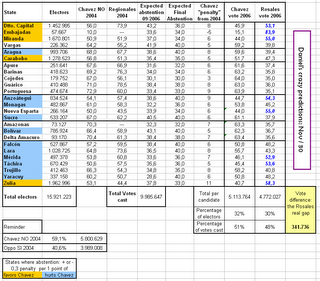 Thus we get the chart below which gives a narrow victory for Chavez (click to enlarge). In states highlighted in yellow abstention favors Chavez, in blue states where abstention hurts Chavez. In bold blue numbers states where Rosales should win. For more details refer to this past link. How come? Do not forget that the way my original sheet was set it favored deliberately Chavez by 1) assuming the contested results of the CNE as genuine (and indications are that they are not) and 2) by playing "normal" politics of government fatigue (even though the Venezuelan situation is all but normal). How could I thus reconcile what is my gut feeling, that Rosales might make it after all, and what my pro Chavez skewed numbers tell me? Read on. This next graph is a reformatting of one published previously with the appropriate updates and arranged now by regions. Click here to see the old version, arranged by electoral weight. Click the graph below to open it in a different window to enlarge and follow better the discussion next. Reminder, the numbers in the first column are the rounded number of electors in each state and the number in the vertical cases on the right are the relative weight of each region. I chose this presentation as it makes it easier to discuss by region than by a mere laundry list of states. This table was done as I thought the political evolution of Venezuela was taking place. That is, I have been observing how the possible advantage of either candidate evolved in each state according to their activities, rally sizes, etc... However I did a mistake in that I went on gut feeling, forgetting that in some states Chavez had too much of an advantage. 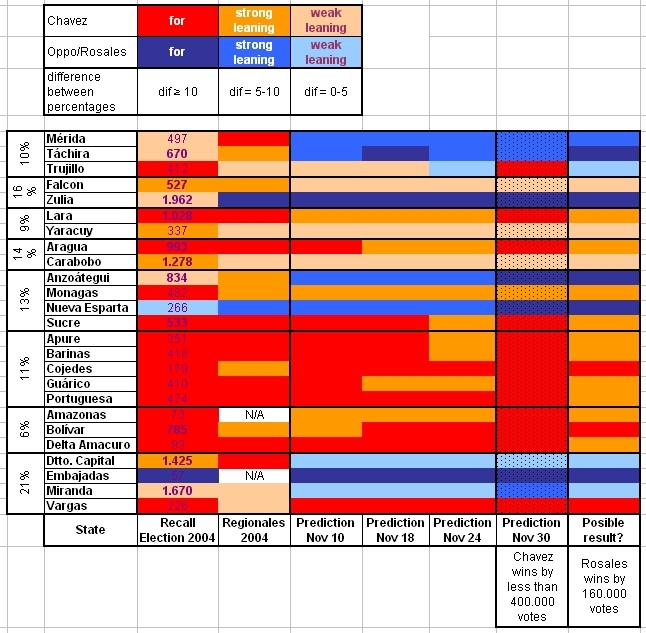 In those states where Chavez had already as much as 30 points advantage even a loss of 10% points would still leave that state in the red column, whereas I was already lowering them to orange. When I did an update of the table posted above I had to go back to reality and do the shaded column which is my "official" prediction, that is, Chavez ahead by 400 000 votes at most, a 51 to 48 result. This is the result that logic dictates, and interestingly the result that the serious polls indicated last week. Some pollsters and Daniel Duquenal agreed, though with very different methods. But in such close results scenarios, in a week all can change, from Rosales pulling an upset after all, to the chavista crowds decididng to vote en masse anyway. Zulia is the home state of Rosales and thus he gets the “favorite son” advantage. If to this you add that he has been a rather good governor, the advantage builds up. And then if you factor in the Zulia pride and the possibility that for the first time they are going to put one of them at Miraflores, the advantage starts ballooning. And if finally you realize that Zulia is the state financing all of Chavez eccentricities, and that people are starting to get tired of the money Chavez is giving away, well, you get a possible 20 points advantage for Rosales there. Zulia should go AT LEAST 60% Rosales and at most 40% Chavez. My informants, and I am willfully breaking the CNE rule of no poll this week, give me Zulia with 30 points, which I find hard to believe, but so I am told. Falcon I am not so sure. The PDVSA fights at Punto Fijo were really bitter and protracted. The Tucacas region did not flourish and agrarian trouble has established there. The state has not progressed and the local governor seems overstaying his welcome. I still rate Falcon in Chavez camp but a surprise upset could come there because of Zulia. After all Falcon is also Maracaibo playground and the effect of Zulia enthusiasm could be enough to send Falcon to the blue states. Rosales was born in Merida and the Andes are the hinterland of Maracaibo, feeling far from Caracas from which they receive only tourists. Chavez did well in the past when he provided services to long abandoned communities. But that seems to have been forgotten. The border with Colombia and the unwillingness of the government to act strongly against crime and guerilla has brought a calamity over Tachira and to a lesser extent to Merida. The students riots and repression in Merida did not help. Tachira and Merida are sure bets for Rosales and even Trujillo might go for Rosales in spite of a previous very strong orientation for Chavez. Both have campaigned hard in Trujillo. In Tachira Rosales benefits from a particularly thuggish governor, Ronald Blanco, who seems to be universally despised in the area and of whom folks wonder how he managed reelection in 2004. Lara Yaracuy are a puzzle for me and I live there. Both should go to Chavez. In Yaracuy putting former governor Lapi in jail has allowed the local failed governor to diminish the impact of Lapi. Normally if Lapi had been allowed to run around the state by now Chavez should be trailing by 10 points at least. But all is not well for Chavez. In the closing days of the campaign he felt compelled to have a short stop in Yaracuy!!! (which weighs little in Venezuela votes). This is due to the deep division within chavistas in Yaracuy as the governor Gimenez is universally disliked except by his PODEMOS supporters. Abstention could deliver a surprise victory to Rosales! Lara should go for Chavez. Though the lousy governor, Reyes Reyes, will probably generate some abstention among chavistas that may or may not be compensated by the more dynamic mayor of Barquisimeto, Henri Falcon, the only chavista I could see myself voting for. Still, the risk there for Chavez is abstention, with the consequence of failing to capitalize on Lara to compensate for Zulia and Caracas. Rosales did a surprising strong show in a Barquisimeto rally and the buzz is that the taxi poll of Barquisimeto streets give Rosales more votes than expected. Aragua Carabobo should have spit evenly for Chavez and Rosales respectively. But in Carabobo the Salas machinery has collapsed and the very late support of Salas Feo might not be enough to save Carabobo. The governor, Acosta “eructo” Carles has managed to make his own political clientele and to even appear as slightly independent from Chavez. No one knows if the governor distancing will promote enough abstention within chavismo to compensate for the Salas collapse. In Aragua we see the reverse phenomenon. Aragua, a MAS and then Chavez stronghold, has suddenly weakened. Perhaps Didalco Bolivar the pro-Chavez governor has overstayed his welcome (he was already governor before Chavez became president!)? Perhaps Aragua did not get from Chavez what it hoped to get? The fact is that Rosales had a great show in Maracay and if he will not win in Aragua he will rob Chavez of a lot of the votes he needs to compensate for his Zulia defeat. Perhaps the final result of the election will be played there: all will depend on how many voters each one manages to preserve in these states! Any strong showing of Rosales in either state is a clue as to his possible victory. This is turning out to be the big surprise of the election. Six months ago pundits said that the strategy of any opposition candidates would be to secure Zulia, Centro and Caracas for a narrow win over Chavez. Oriente states were conceded, except Nueva Esparta, to Chavez. Well, it seems that Anzoategui will go strongly for Rosales and that the effect of Anzoategui could bring an upset in either Sucre or Monagas. Underestimating Anzoategui was a mistake. This state never fully embraced Chavez. Tarek Saab was elected governor there because Chavez imposed him. Soon he run into trouble with chavistas, amen of his anti Semitic activities. Chavez visits to the state are marred by internecine warfare as the fortunes of Tarek plummet due to his very poor managerial skills and his talibanic positions on issues. It is possible that Rosales will carry Nueva Esparta and Anzoategui with enough votes to compensate for Sucre or Monagas where chavismo seems more established. Though Rosales could carry Monagas and I was told that Sucre might be more willing to vote against Chavez than what people suspect. The Sucre governor, Ramon Martinez, is another noted corrupt official who is there because he managed to gain Chavez support, not his people, at least if we base ourselves on some recent events such as the Guiria fishermen fiasco. They remain the only arguable stronghold of Chavez, where he benefits of the “favorite son” complex. But Rosales was big in Barinas, in remote Calabozo, in San Fernando. The only “failure” came in San Carlos where Jhonny Yanez, one of the biggest thugs in chavista files, even managed to block the airport access to Rosales. All in all Chavez should carry the Llanos but by a much lesser margin than expected. Why? All the land reform, all the corruption scandals such as the CAEZ indicate that Chavez has been trying to favor the area. However there has been too much nepotism in Barinas, too much violence in rural areas, not enough support for the peasants resettled on the expropriated lands. Agriculture is faltering in Venezuela, we import more and more food and the grain belt of Venezuela is not coming through. Surely this must mean that the quality of life is not improving in the Llanos and Chavez is losing ground. The only surprise I expect in the Llanos is in Portuguesa where the governor has some civism left in her and where the democratic left tradition of past eras might come back to Acarigua and Guanare. The other states should still go for Chavez though perhaps with no more than a 10 points margin of victory! Though Guarico could have an interesting result as the local governor of the PPT has a big feud with the MVR. Manuitt is a thug accused of crimes committed by the police under his orders. How this will play is cryptic, Guarico being perhaps the state with the biggest “fear factor” of all. This is simpler. The two “native” states of Amazonas and Delta Amacuro are the ones supposed to have done great under Chavez when this one improved Natives rights. But in practice this has not happened and Caracas streets are littered with beggars from Delta Amacuro. These states are highly unpredictable today though they tended to vote for whomever was in charge in Caracas. Yet the surprisingly large turnout at Puerto Ayacucho for Rosales allows one to speculate wildly! But whoever wins there, those two are the lowest states vote wise. Bolivar state is another matter. Today it seems to be the only state where Chavez can expect a big victory, by perhaps more than 20 pints. This did not used to be so. Chavez has made Bolivar more than ever dependent on Caracas. He is hell bent to prove that state industries can do well and he is not afraid to invest/throw whatever money is needed to prove his point. Cost effectiveness is an unknown concept for Bolivar managers. Eventually this buys enough votes in spite of a rebellious past with Velazquez and the Causa R.
The assassination of the Indian miners in La Paragua in September was a national event that played a lot for Rosales. When he went to visit La Paragua everyone went out to receive him, the bells tolled. But Guayaneses were not impressed. See, they consider miners to be a plague, and even worse, to be foreigners from Brazil. Whether they are right, the thought among the Ciudad Bolivar and Puerto Ordaz populace was that the miners had it coming. As a result La Paragua was an early boost for Rosales, while it might have made him lose for good the rest of the state. If you add a big bridge for the imaginary of the folks, you can understand that even if the bridge is in fact incomplete, the state will go with Chavez as money will keep pouring down there. Let’s start with the mystery of Vargas, a state if any that suffers from the battered wife’s syndrome. It seems that the most disaster befall Vargas, the more Chavez gains! Unbelievable! From a particularly incompetent governor, to an incompetent recovery agency, and a fallen bridge, going through a belt of misery, nothing makes a dent, Chavez rides high in Vargas. I think it might even be the only state that Chavez has not visited recently! And yet were there to be only one state that is doing worse than 8 years ago, it would Vargas. Caracas is a more complex problem but the answer comes simply form last weekend rallies. Let’s do a simple arithmetic. The greater Caracas and Miranda state are 3 million voters. If 25% do not vote we are left with 2.2 million voters. 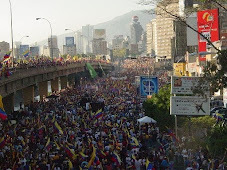 At least 600 00 showed for Rosales event strictly from the Caracas area. If one assumes that for every marcher there is one Rosales voter left behind at home or work, we have a conservative 1.2 million votes for Rosales. And hence 1 for Chavez. A 200 000 victory at the very least for Rosales. And if we consider that the Caracas contingent of the Chavez event was 200 000, then we have only 400 000 votes sure for Chavez in Caracas. The margin of Rosales victory could be much more than 200 000. How come? Caracas has become unlivable: huge permanent traffic jams, garbage everywhere, ultra expensive housing even in miserable areas, poor health services in hospitals, etc, etc.. Combined with painful incompetence of the chavista mayors of the area and it is not surprising to see that Chavez is not doing good there. I still think that Chavez might not do too bad if he convinces popular sectors to go and vote. But no matter what, Rosales victory by 5 points at least in both Miranda and DC is unavoidable for Chavez. Based on reason and “conventional” political wisdom Chavez should win, albeit by a meager 5%. That for him would be almost as bad as a loss as it would compromise seriously the implementation of his socialo-communist project. The country will remain ungovernable for years. His international image will be tarnished. He will not be able to sustain a 100% monochromatic national assembly. There is reasonable chance that Rosales squeaks by with a bare 200 000 votes margin. Will Chavez accept? Will he try to cheat? Will he create commotion? Will he give the presidential sash to Rosales and sabotage from day one his administration as a formidable leader of the opposition, a place he was born for!? And there is a not too crazy chance for Rosales to reach a 500 000 margin that would put Chavez against the wall and force him to accept what he cannot accept. With a 500 000 victory vote the army would not back Chavez in an adventure and will prefer to sit down with Rosales to negotiate a way to allow him to let them enjoy 8 years of discreet plundering. A small price to pay to avoid civil war, if you ask me. But for this to happen we need 1) strong chavista abstention in some areas, 2) a clear victory for Rosales in Carabobo, Anzoategui and Miranda. The answer in the wee hours of December 4. PS: I had to do some editing this morning. I should not be writing such long and complex post at night. I hope it is a little bit clearer to understand.